This book. I’m not sure I have the words to do it justice. I’ll try, but know that the depth of emotion this book pulled from me just doesn’t seem to translate into words to the level I wish it would… which means you’ll NEED to read it too. So what touched me? Each character had their own flaws, just like everyone else in this world. They each had their own defensive mechanisms to guard against hurts and what the world may throw at them – an ever-present smile, studying and books, or a stony/cocky silence. No one was pushed into a stereotypical role; each person had redeeming qualities but they also hid. The angst factor was related to how people hid parts of themselves in plain sight. Yet, written words broke barriers, letting people “see” and “hear” each other. Yes, it seem s like the classic love story at first glance. But the beauty of the story is the emotions serving as the ever-present undercurrent, ebbing and flowing with each turn of event. How do you choose happiness? Do you put yourself first? Do you sacrifice your heart to ensure the happiness of those in your heart? This book presented situations where there was no easy answer, just a lot of soul searching. The series is aptly named. Beautiful Hearts. There are a lot of beautiful hearts out there. Sometimes they are buried beneath hurt and expectations, but with a little digging and patience, you’ll find them. The written word…you write something, put it out in the world, and it can live forever. Scott’s words are currently haunting me. I’ve read her other books – and loved them – but the way I invested in each of these characters, felt the complexity of their emotions and dilemmas set this book apart and above others for me. I don’t feel the need to talk about the pace of the book or how the plot line flowed. My above words should make it evident that Scott nailed all of those aspects (as always). What she wrote was a part of her heart, a difficult journey of love and friendship. Until I read book #2, I will carry the angst and hurt until I know more of where Scott wants to take these characters. Not only do I recommend this book with 5 stars, I hope you will also wait with baited breath for the next book in the series. 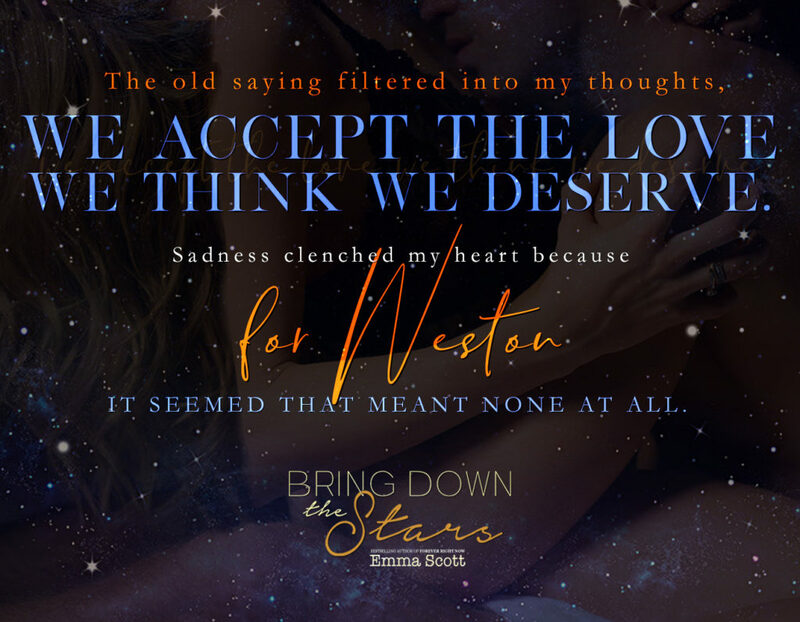 The first in the Beautiful Hearts duet, Emma Scoot’s Bring Down The Stars is a story encompassing many types of love; familial, friendship, and romantic. Three people will have their lives irrevocable changed by love and their journey is captivating. More than a half dozen times I was moved to tears by Emma Scott’s writing. She shows us how there people are changed by the use of words, leaving me feeling grossly under-skilled to write a review. But Scott shows us that while skill helps, what counts, what makes it real, are feelings. Words give us the intensity, convey the sincerity and in BDtS, we are reminded of the power of words. One thing made clear is that love is messy and the feeling of devotion is complex. The story of three people, at a point in their young lives where relationship baggage, good and bad, motivates the decisions they make. In the heat of the moment, one young man swallows his words, only to have them poor out of him in a way that both wins the love of a young woman while betraying her trust.